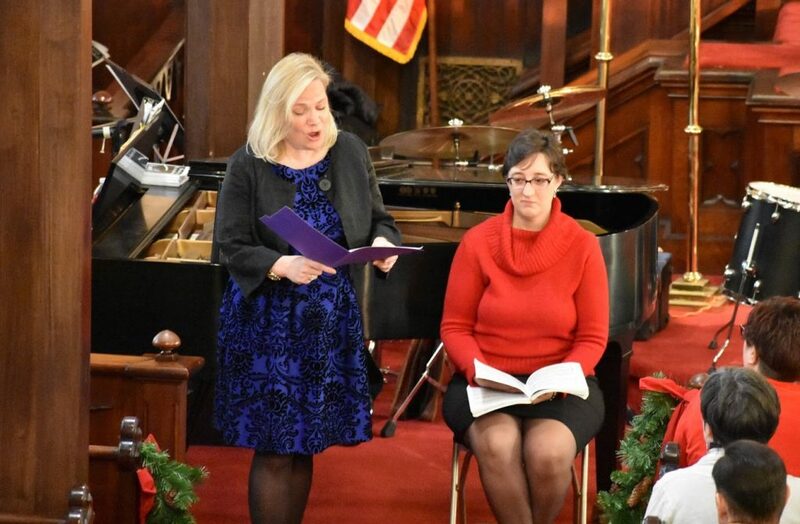 On Sunday, December 2nd, the First Presbyterian Church of Albion was the place to be. 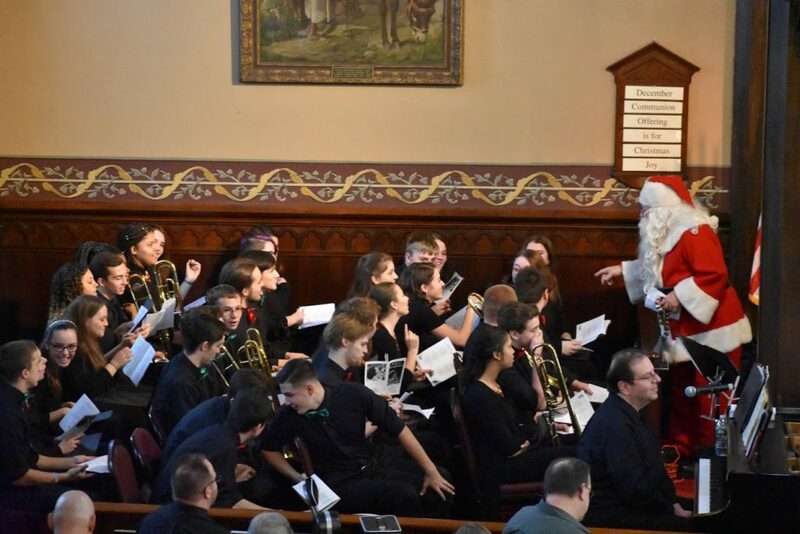 It has become an Albion Christmas tradition for the church to host the annual concert showcasing a multitude of local area talent in a wonderful Christmas concert. 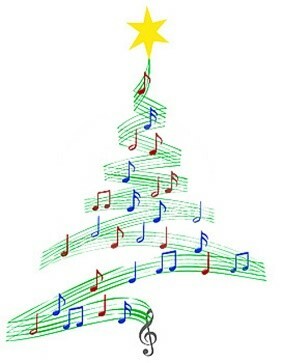 The concert keeps getting better and better each holiday season – and this year is no exception! 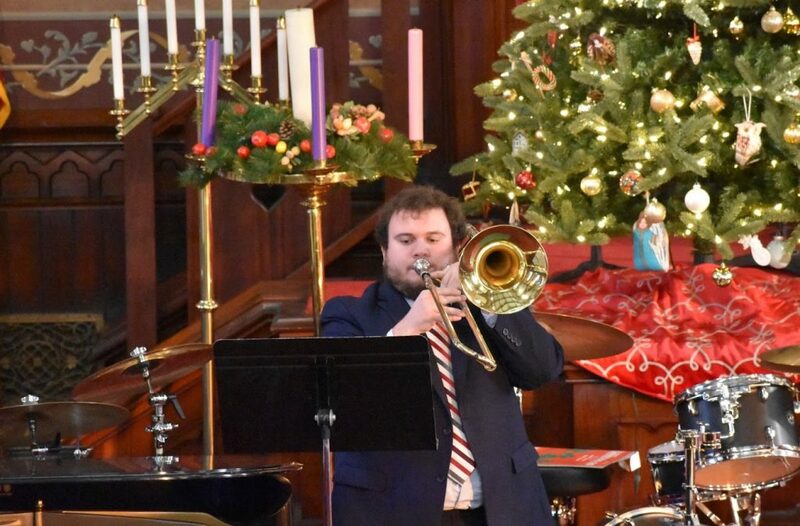 The 2018 Christmas in the Neighborhood Concert benefits the Albion High School Alumni Foundation and was, again, loaded with talented AHS Alumni, students, teachers and retired teachers, and other local talent. The program never disappoints and is a testament to our amazing community! Concert organizers, Charlie Nesbitt (Class of ’65 and Alumni Foundation member) and Rev. Susan Thaine (Class of ’86 and Pastor, First Presbyterian Church of Albion) opened the concert. Santa made an appearance and wow’d the crowd! 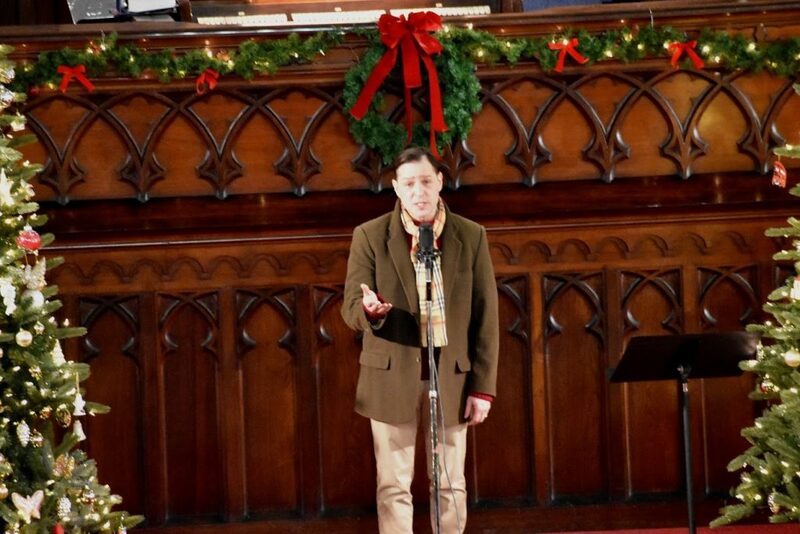 Other performances were Rev. 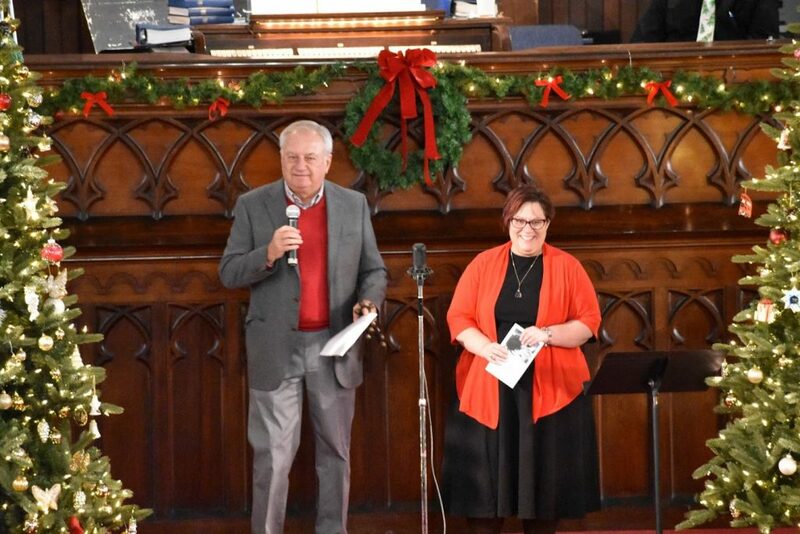 Sue Thaine (Class of ’86 and Pastor, First Presbyterian Church of Albion) singing “Sweet Little Jesus Boy” and Gary Simboli (Class of ’81 and Albion music teacher) singing “O Holy Night”. We thank our sponsors, all who attended and, especially, all who performed and organized this amazing event. Following is from an insert in the program for the event – it is the impressive resumes of all of the performers! Please take a moment to read through it to see the amazing creative backgrounds of our local talent, including, AHS alumni, students, and teachers. 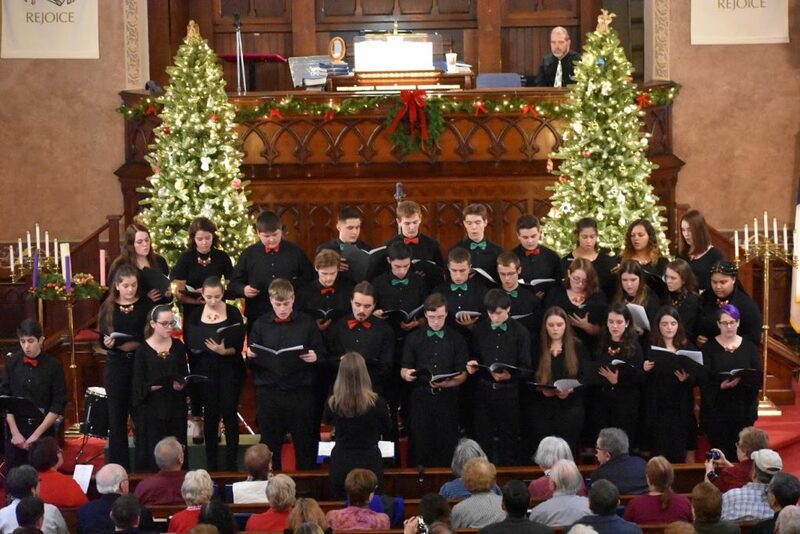 Albion High School Select Mixed Chorus was created by joining the Albion Women’s and Men’s Select Choruses. These wonderfully talented young women and men rehearse once a week separately and then come together to rehearse their combined selections. They prepare their own concert selections and then combine to create this gifted ensemble. Students are in grades 9-12. This year Mr. Simboli and his students are blessed by the addition of our new Co-Director Anna Atwater. AHS Trombone Choir is one of five select ensembles that comprise the Instrumental Chamber Ensembles program at Albion High School. These small, extra-curricular ensembles rehearse once per week, and perform frequently throughout the community. The performance schedule culminates with an annual chamber music concert, held in May at one of the historic churches here in the village. 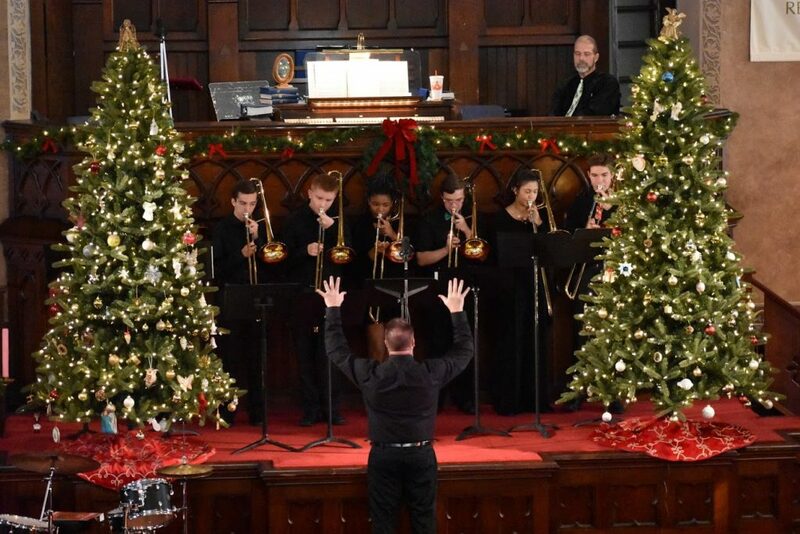 Trombone Choir members are: Jacob Ettinger and Evan Allen (seniors); Richard Flanagan (junior); Saleya Williams, Joshua DePoty, and Annabella Salisbury (sophomores); and James Beach (freshman). Anna Atwater is the elementary vocal teacher at Albion. She also co-directs the Women’s Select Choir with Gary Simboli and teaches voice lessons at Gotta Dance. Anna received her Masters of Music in Vocal Performance and her Bachelors of Music in Music Education. 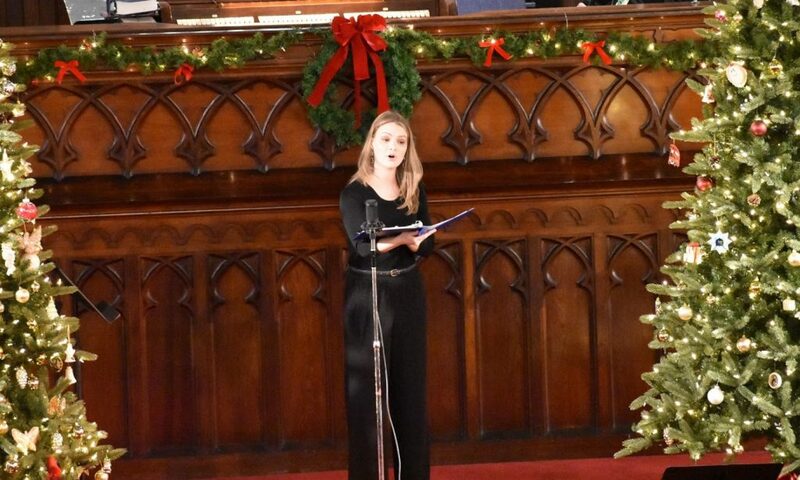 Anna currently sings with Concentus Women’s Chorus and Voices, two highly-regarded choirs in Rochester, NY. Gary J. Simboli is a 1981 graduate of Albion High School, a 1985 graduate of S.U.C. at Geneseo and a 1999 graduate of S.U.C. Brockport and in 1999. He holds a BA in Music and a MS in Arts for Children. This is his 34th year with the Albion Central School District where he is the Director of Vocal Music and the Arts Department Theatrical Productions at Albion High School. He is currently directing his sixty-ninth theatrical production, Into the Woods…which will be March 29 and 30, 2019…evening shows at 7PM and Saturday matinee at 12PM…all tickets $5.00…a shameless plug, but it had to be done! 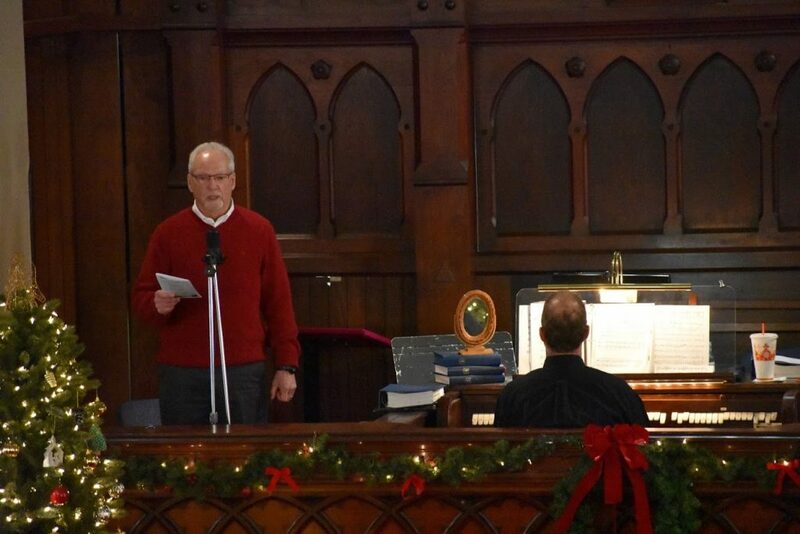 Gary is the organist at the First Baptist Church of Albion and Co-Musician at Albion First Presbyterian Church. As a cabaret performer, he has performed his act multiple times at Albion’s own The Cabaret at Studio B and Don’t Tell Mama, in New York City. Throughout his teaching career, he has been awarded with the Albion Central School Teacher of the year, twice the National Honor Society Teacher of the Year, the News 8 Golden Apple Teaching Award and the Rotary Paul Harris Fellow Award. He and his wife Laura have been married for thirty-two years and reside in Albion. They have two beautiful feline children named Rachel and Giada. Joseph Condoluci is a graduate from Albion High School, class of 2012. He also attended Roberts Wesleyan College and graduated with honors in music Education. Currently, he is substitute teaching for the Albion and Brockport Central school districts. Outside of work, he also continues to help the Albion Marching band every year as their music and marching tech. He is also beginning to pursue Grad school with a concentration in Wind Conducting. He frequents St. Joseph’s Catholic Church here in Albion and oversees some of the musical aspects there. Karen Kenney Conn is a graduate of Albion, class of 1986. Karen attended Mansfield University and received a Bachelor of Music in Music Therapy in 1993. Went to Roberts Wesleyan and received my Music Ed certification in 1998. Finished grad school at SUNY Brockport in interdisciplinary arts for children in 2003. I have had the pleasure of doing music therapy since 1994. I’ve worked at Strong Memorial hospital, Rainbow preschool and currently at Albion Central where I have been also teaching general music since 2007. Lance Anderson is a 1983 graduate from Albion High School. 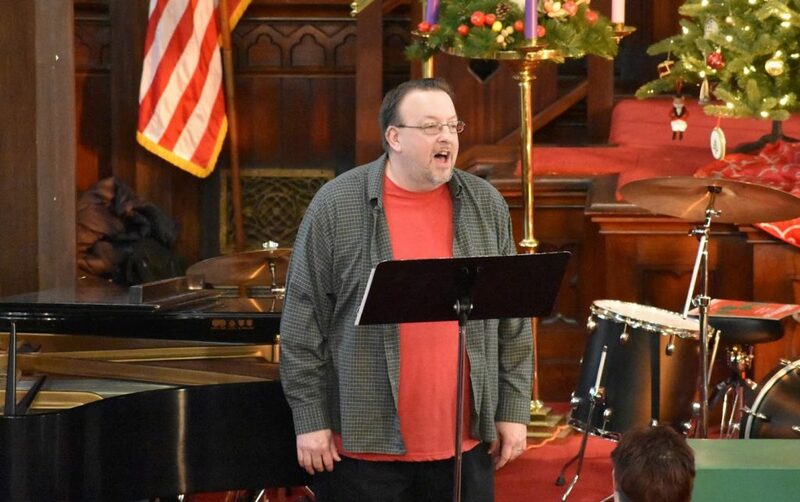 He is a private voice teacher who has students in Albion, Medina, Batavia, and Spencerport. Lance is also the president of the local community theater organization, Lake Plains Players and has directed and performed in many shows with them over the last 30 years. Lindsey Almeter is in her 5th year of teaching Elementary Band at Albion and is Assistant Marching Band Director at Albion High School. She grew up close by in Pembroke, and attended SUNY Fredonia for her Bachelor’s and Master’s degrees in Music Education. Maarit Vaga has made Albion her adopted home after living in far-flung places from Finland to Vancouver B.C. Her first love was music and she spent some years studying and singing opera in NYC under the tutelage of Vincent La Selva at the New York Grand Opera in Carnegie Hall. 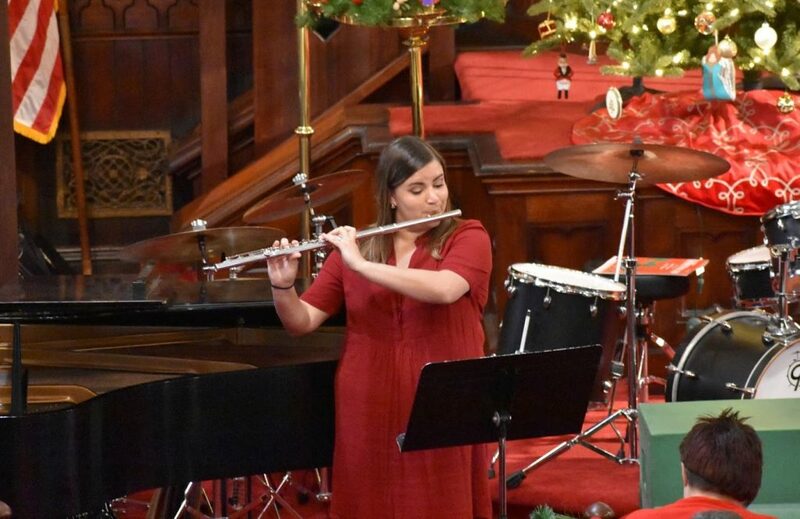 She was selected as Finlandia Foundation’s Performer of the Year for two consecutive seasons and spent the time touring around the US and Canada, presenting recitals and concerts of music by Finnish composers. Her favorite memories are of performing with her accompanist, Darryl Smith (of Albion) for the president of Finland, Tarja Halonen; singing in Jean Sibelius’ birth-home in Hämeenlinna, Finland; and of performing at a Gala Concert at the Kuressaare Opera Festival in Estonia. Maarit continues to sing on frequent Sundays at her home church of Christ Episcopal. She and her husband, Jan-Mikael Erakare have been blessed to raise their four children in Albion, each of whom is a musician in their own right. Rev. Aleka C. Schmidt (Mezzo-Soprano) is pastor at Albion First Baptist Church, and serves as a Spiritual Care Coordinator at Supportive Care and Hospice of Orleans. Aleka received her Bachelor of Science in Music Therapy and Applied Voice Studies from SUNY Fredonia in 2001. In 2017, she completed the Master of Divinity program at Colgate Rochester Crozer Divinity School, and became an ordained minister in the American Baptist Churches, U.S.A. in 2018. Aleka and her husband, Scott live in Medina with daughters Hayley & Danielle along with an ‘ark-full’ of household pets. Together, they own/operate of Pets in Peaceful Rest Pet Cremation and Memorial Center in Lockport. 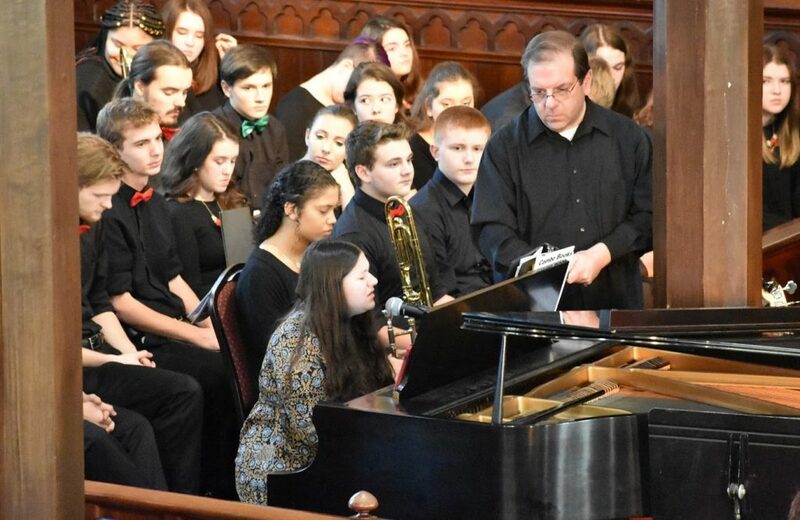 Aleka and Scott offer their musical gifts throughout the year in support of local charities and ministries. 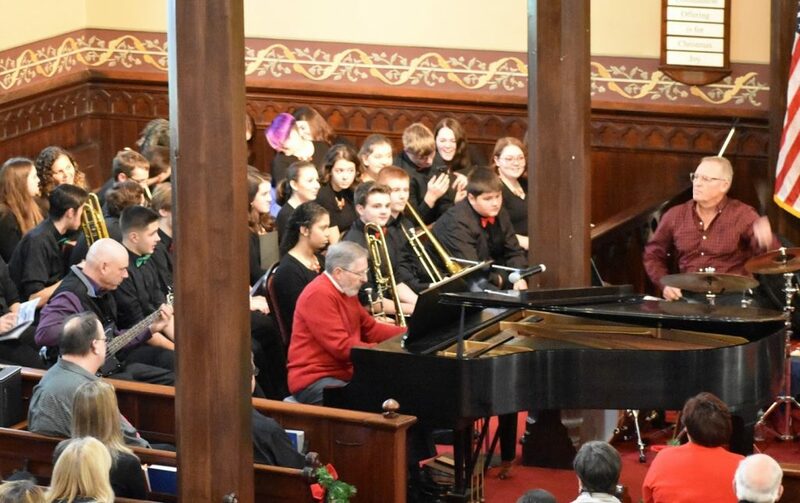 Scott Schmidt began piano lessons at age 8 with Rose Gibson in Tonawanda and at age 15 began his organ studies with Dianne Siefert, former Music Director/Organist at Lockport 1st Presbyterian Church. He has served as Organist and Choir Director at Mt. Olive Lutheran Church in Lockport, Concordia Lutheran Church in Kendall and has substituted at many churches in Orleans County. He currently serves as organist at Barre Center Presbyterian Church and is Co-Church Musician at Albion 1st Presbyterian Church. Scott’s love for sacred music was a direct result of his grandfather introducing him at an early age to the Mighty Wurlitzer Organ at the Riviera Theatre. 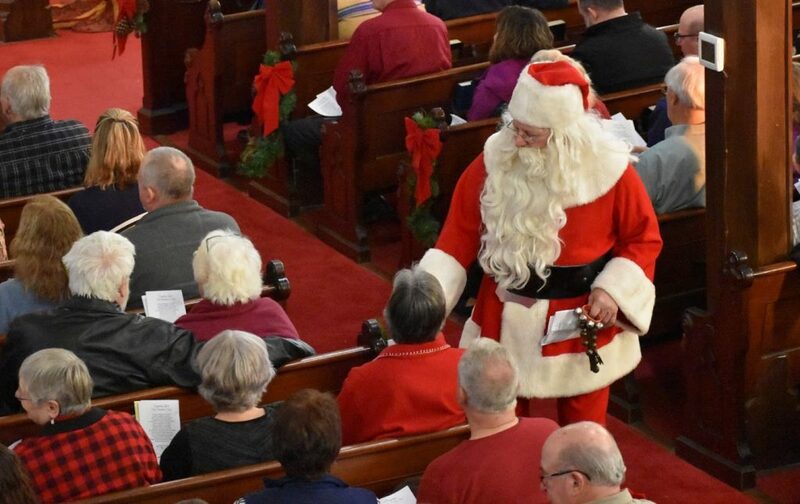 In addition, he would accompany his grandfather to organ recitals and hymn-sings featuring local artists at Holy Trinity Lutheran Church in Buffalo which houses a 156 Rank Moller Pipe Organ, the largest pipe organ in WNY. Scott is a Funeral Director with Christopher Mitchell Funeral Homes and is Chief Coroner of Orleans County. He is married to Rev. Aleka Schmidt, pastor of the Albion 1st Baptist Church and is the father of Hayley and Danielle Schmidt. Shannon Vanderlaan is a singer/songwriter, pianist and oboist from Albion, NY. Shannon is a 2011 graduate from Albion High School and a 2015 graduate from The College of Saint Rose where she received her Bachelor of Science in Music Industry. In 2017, Shannon released her self-produced album Atmosphere and regularly performs her original songs throughout Western New York. Shannon is currently teaching private voice, piano, and composition lessons in Rochester and is a substitute teacher in the Albion Central School District. Susan Collins Thaine is the current pastor and choir director at Albion 1st Presbyterian church and a 1986 graduate of Albion High School. Sue is married to Mike Thaine and has two adult children, Abby and Kyle. She earned a B.S. Degree in Applied Voice from Roberts Wesleyan College, a Certificate in Volunteer Coordination from St. John Fisher College (with United Way), and a Master of Divinity Degree from Colgate Rochester Crozer Divinity School. The Billies is a men’s a cappella vocal quartet. The student run group was formed in the spring of 2017. The group, made up of Albion High School Seniors, includes Jacob Ettinger-Bass, Nathaniel Grammatico-Baritone, Enoch Martin-Tenor 2 and Evan VanAmeron-Tenor 1. 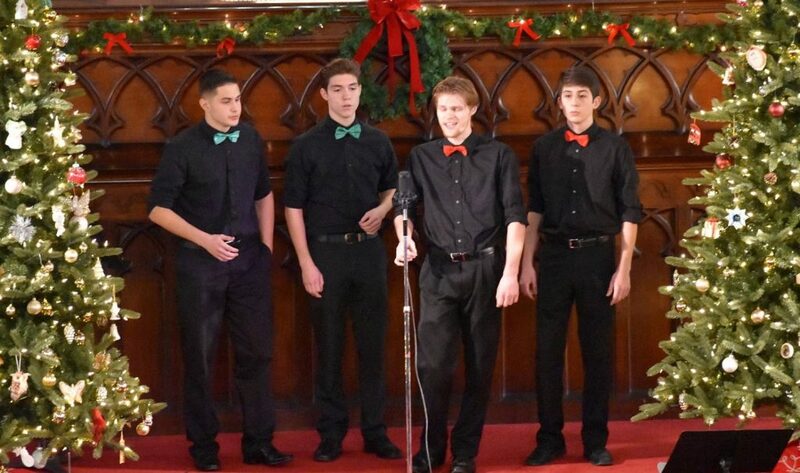 The guys have performed at multiple AHS Talent Showcases, the Cabaret at Studio B and the AHS Senior Tea. 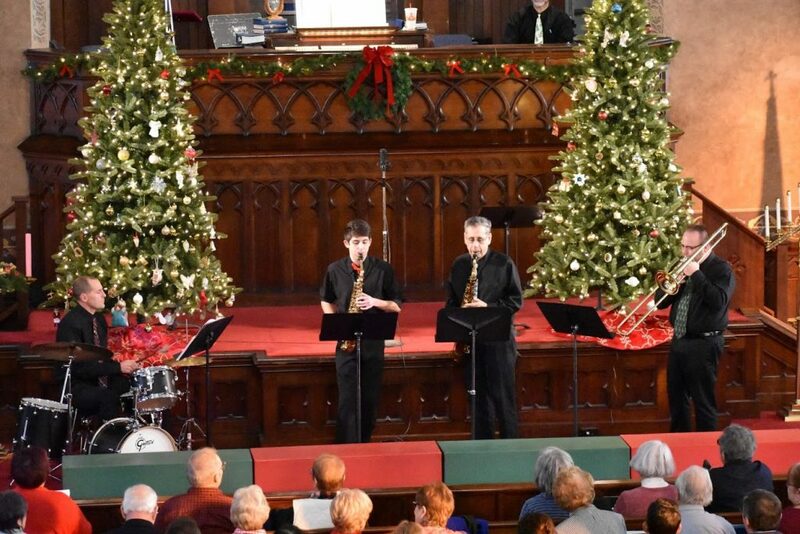 The Gramm Crackers is a jazz quintet formed in December of 2017. Nate Grammatico plays alto sax and is a senior at Albion High School. 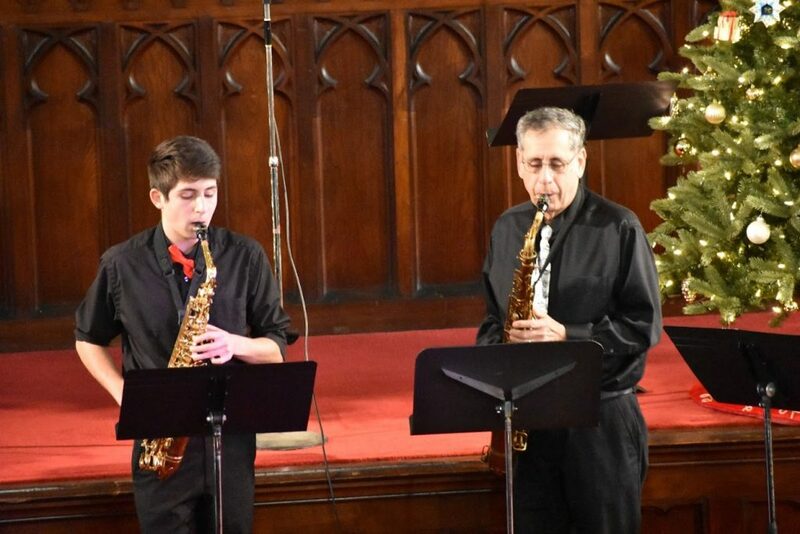 Mike Grammatico, tenor sax, retired from Albion Central School in 2000, ending a 33-year career teaching Instrumental Music in the Lyndonville and Albion school districts. Pianist Gary Simboli is a 1981 graduate of Albion High School and currently teaches vocal music there. Mike Thaine, trombone, is Director of Bands at Albion High School and a member of the AHS Class of 1986. Drummer Greg Martillotta graduated from Albion HS in 1988, and teaches 6th-8th grade Instrumental Music at Albion Middle School. The Kingsmen Robert Chaplin resides in Waterport, NY and is a retired music instructor who worked with inmates in the New York State Correctional System for many years. Throughout his life, he has played drums for many bands in the area and has performed as a percussionist in several pit orchestras. He currently performs as a percussionist and timpanist in the Genesee Symphony Orchestra. Daniel Deluca lives in Batavia, NY and has been a music instructor in the Leroy School System for over 20 years. He regularly performs in bands and combos all over Western New York as a bassist and guitarist, in addition to being a much in demand private guitar instructor at Roxy’s Music in Batavia. Gary Deiboldt lives in Albion, NY and is currently retired after teaching music in the Elba Central School District for 33 years. He has performed as a percussionist and pianist in many bands and ensembles throughout his life and enjoys writing and arranging music in addition to performing with Bob and Dan.